As I explored in my previous post, opening yourself to resonate with another’s pain is a risky endeavor—when you stop avoiding or fixing, and really open your heart to someone’s pain, you’re going to feel it. You’re going to hurt too. But as you courageously open yourself to resonate with another’s pain, your humanity, your emotional presence becomes an empathic space where you can hold another who is in doubt, grief, or pain. This open-hearted courage to just be emotionally present with someone in a dark place is often the very best balm you can offer. Opening your heart to another is a holy work, and all of us are needed to do it. So, yes, opening your heart does mean that your heart is going to hurt—and even break—from time to time. You know this to be true, as a parent, a lover, or as a friend. Loving your children means you will feel some pain when they experience rejection or disappointment. Loving your spouse or a friend means that you’ll carry some of the heaviness when he or she is shouldering a burden. Here’s a beautiful truth: opening your heart to resonate with another’s pain also opens your heart to healing, joy, and expansion. Sitting with someone in suffering offers the opportunity to tear down walls and to really commune with your fellow sojourners in life. As you allow yourself to connect in this deep way, you’ll feel humbled and grateful for the privilege of being trusted, for the honor of listening and connecting. You’ll feel joy as you experience yourself becoming a true friend—one who is willing not only to celebrate successes and good times, but also to remain close and loyal during times of heaviness. With an open heart, you’ll feel your own capacity for love and life expand. Having extended compassion to others, you’ll be more able to extend that same loving kindness to yourself when difficult times come. You’ll remember more easily that you’re not alone. Open hearts grow stronger—because open hearts grow together. If you’d like to increase your courage to be open-hearted with others in pain, you can access a reservoir of strength by remembering times when you’ve received that same sort of gracious presence. Take a moment to remember an instance when someone was there for you, at a time when you really needed help. Recalling your own experiences of having felt someone’s support, care, and solidarity can give you courage to pay it forward. Who could benefit from the light of your emotional presence? Who could be comforted by your emotional responsiveness and empathy? 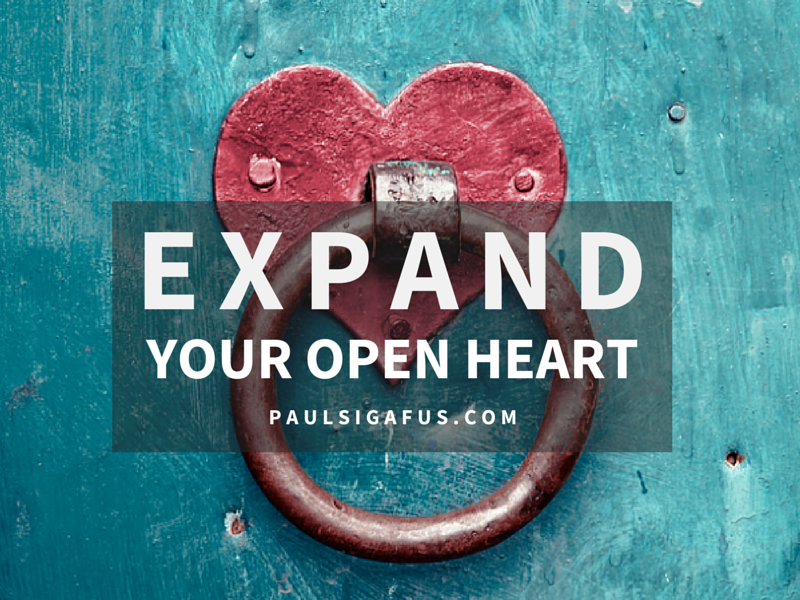 As you open your heart to others, you’ll experience your life expanding.